The Alldocube brand has launched a promo on its M5X tablet that is near to ends because just 2 days has left for getting a coupon of $26 to save on Banggood. However, it will be necessary to do quickly before the stock break. To take advantage of this offer, use the discount code [ 0c4fff ] before confirming your order. Buy this model for just $163.99. The Alldocube M5X is a tablet that has an IPS JDI Sharp 10.1-inch 2K screen, with dimensions of 24 x 17 x 0.8 cm, for a weight of 510 grams. We are, then, before a tablet that can be considered as manageable and transportable, with a perfect size to enjoy multimedia content. Part of MediaTek’s MiraVision display suite, it modifies various display parameters in response to changes in ambient lighting and screen content to reduce display power consumption by up to 25%. Inside the Alldocube M5X, we will find a MediaTek Helio X27 10-core processor at 2.6 GHz, accompanied by 4GB of RAM and 64GB of internal storage expandable by MicroSD card of up to 128GB. 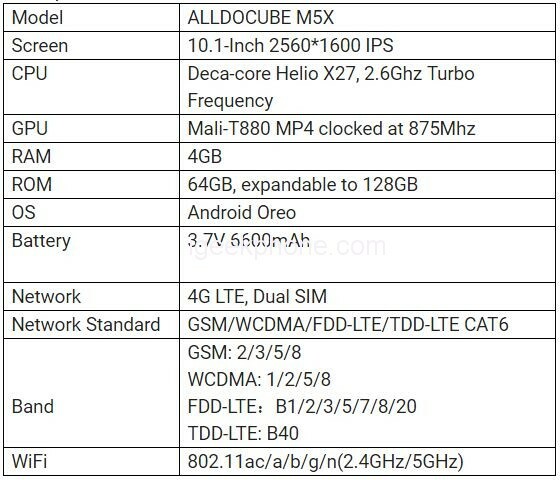 Also, it agrees to emphasize of the Alldocube M5X its connectivity 4G to sail by the Internet although there is not a WiFi network available. In view of its characteristics, the Alldocube M5X can be a very valid option for any type of user, especially when we talk about the price. Currently, you can get in Gearbest, com “flash offer” for only $169.99. If you are looking for a tablet, the Alldocube M5X has everything you need to be your choice. For more information just visit the official website of the Alldocube.